Curtis Granderson swings an M9 M110 bat and wears TPX batting gloves. Curtis Granderson has picked up right where he left of in 2011, when he was 2nd in the league in home runs with 41. 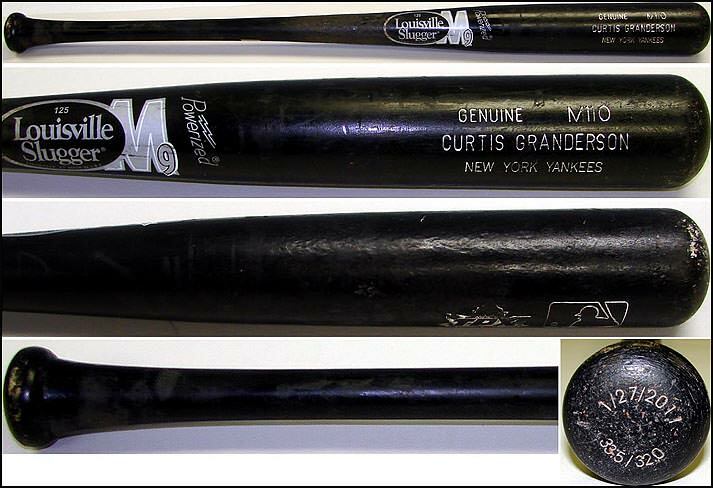 This season, Granderson is tied for the AL lead in home runs with 9 (as of 5.2.2012) while swinging the Louisville Slugger M9 M110 maple bat. Grandy’s model and color (black) are available online. You might think of Granderson as a guy benefitting from Yankee Stadium’s short porch. According to ESPN’s Home Run Tracker, though, Granderson was second in the league behind Bautista with 11 “No Doubt” home runs in 2011. Don’t take my word for it, just take a look at the video below and tell me this guy doesn’t have massive power (and yes, the first one DOES hit the top of the wall, but the Stadium goes 385 to the gap so you can’t say that was a cheapy). Curtis Granderson swings the M110 wearing Louisville Slugger/TPX Bionic batting gloves (game-worn versions seen in the feature photo). He wears the whites you see above at home and the greys away. They are exclusives, as the blue trim on the insides of the fingers are not available online, though you can find both whites and greys available online. Granderson is a Phiten endorser. He wears, to the best of our knowledge based on the research we did, two of the Phiten X30 Razor necklace, one in navy and one in white. Neither of these colors are available online, though there is a black version like the one in the feature available. Granderson has plenty of good things to say about these necklaces (and he’s a great interview), and after all the endorsements from WPW featured players, I’m starting to be convinced—as much as I try to fight it. I think I’m going to try one out, see how the pitching elbow/shoulder respond.